ISABELA CITY, Basilan-Consistent with the inclusive growth campaign, DOLE, thru the Isabela City Field Office (ICFO) conducted consultation and orientation on the process of registeringRural Workers Association (RWA) and menu of services to 19 workers associations on June 25, 2013 at JB Dans Gymnasium, Barangay Sunrise, this City. The convergence was in partnership with the Isabela City Social Welfare and Development Office (CSWDO) intended to guide the associations acquire legal personality to this hands-on experience on filling-up the relevant forms and attachments and to have a personal encounter with the officers and members of the RWA's. Eighty-three (83) participants mostly officers attended the multi- organization convergence meeting coming from different marginalized groups such as women, youth, fisher folks and farmers who are potential recipients of livelihood assistance under the Self Employment Assistance Kaunlaran (SEA-K) of the Department of Social Welfare and Development. Relevant DOLE's Anti-Illegal Recruitment - Trafficking In Person (AIR- TIP) form part of the module of the consultation. The SampungKautusanKontrasa Illegal Recruitment served as an eye opener and reminder to marginalized and vulnerable groups. In a related development, three (3) women associations from barangays Sta. 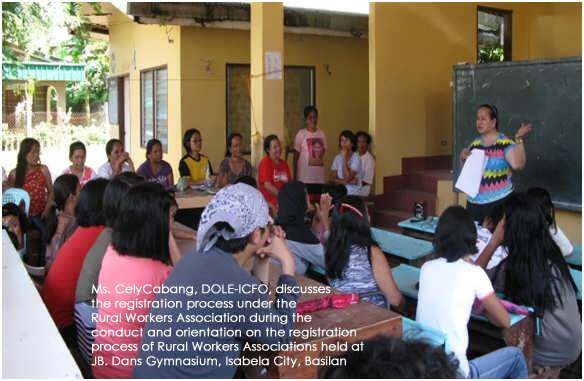 Barbara, Sumagdang, and Lanote were also given orientations and briefings on DOLE integrated Livelihood Program and Services on July 6,12 and 22, respectively, at their barangay halls. A total of 210 informal sectors workers participated including barangay officials who engaged in a dialogue for possible livelihood interventions and services to their constituents. For this year, the DOLE Isabela City Field Office facilitated the turn-over of business starter kits to one hundred ten (110) informal sectors beneficiaries in the amount of Php 924,740.110. Aside from the tools, jigs and equipment, the department is also facilitating the enrollment of the beneficiaries to the social protection program especially with the Social Security System.